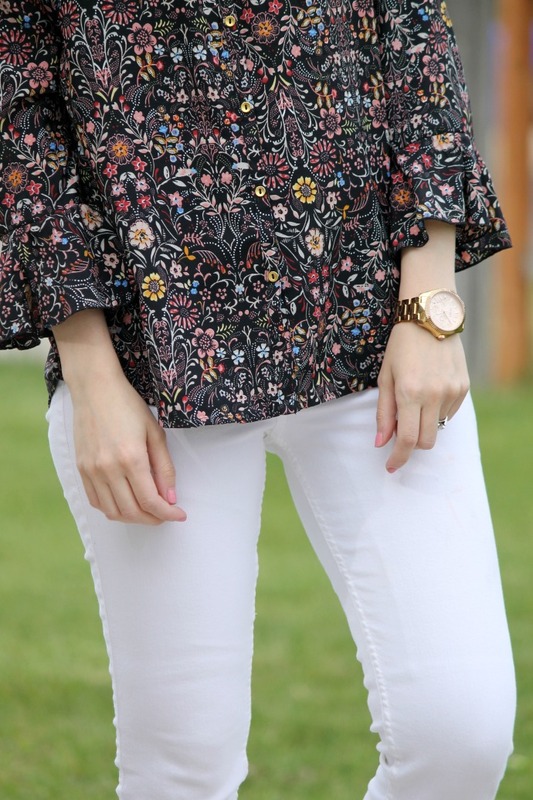 I love wearing white denim in the summer, this black floral top was the perfect contrasting piece against my bright white jeans! I love things that make a statement and this outfit is bold without being too wild. keeping the shoes a light, simple color allows my top to really be the highlight here. I adore the sleeve detail on this blouse, it’s just so feminine and right on trend too! I’ll link below more ruffled things 😉 because I really can’t get enough! thank you so much for reading! I hope you’re having a fabulous weekend! since being back from vacation I’ve been busy at work and haven’t had much time to get posts up! I did get my house mostly cleaned though 😉 so that’s good!